We get a lot of enquiries about solar power and batteries, especially since Elon Musk started talking up the Tesla Powerwall, a 7kWh lithium ion battery. 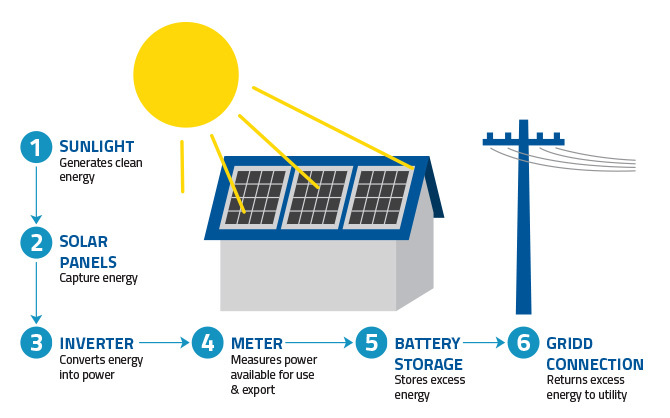 But what is the reality behind solar batteries and savings? They found that depending on your usage, whether you already own solar panels, and other factors, the ‘payback’ time could range from as little as 13 years or as much as 29 years. Given that the Powerwall is guaranteed for a lifespan of ten years, you’d need to be motivated by something other than economic advantage to install a Powerwall – if you could get one. Battery or tariff feed in? Our PRF solar expert team has done some calculations, and in our opinion, for the time being feeding energy back into the grid is probably the most economical approach. It costs around 22 cents per kilowatt-hour to produce solar electricity and battery-store it, compared to Western Power’s cost of 26 cents. If you installed solar and applied for the Renewable Energy Buyback Scheme (REBS) before 30 September 2011, you’d still be getting 40c/kWh for energy returned to the grid – a generous rebate. For other residential customers, you’ll get 20c/kWh for electricity returned. Sooner or later, feed in tariffs will reduce further and may even disappear altogether. At that time, demand for batteries will most likely surge. But be aware, a battery will probably not make you independent of the grid in any case. If you’re thinking about feeding energy back into the grid for now and adding a battery later, the good news is that won’t be a problem. In fact, as battery costs are likely to keep coming down and battery efficiency is almost certain to keep increasing, that’s probably the smartest approach. The team at PRF Electrical has been dealing with solar power for a long time now. We can answer your questions, help you calculate your photovoltaic (PV) panel needs, and complete the installation professionally. We’ll also show you how installing an app that monitors your solar energy production and usage can help you maximise the efficiency of your system, and minimise use of electricity from the grid. To find out whether solar power makes good financial, environmental and practical sense for you and your family, why not call Phil Fraser at PRF Electrical.